To pickle vegetables: Pour vinegar, water, salt and sugar in a medium saucepan and bring to a boil. Whisk until salt and sugar are dissolved. Allow vinegar mixture to slightly cool. 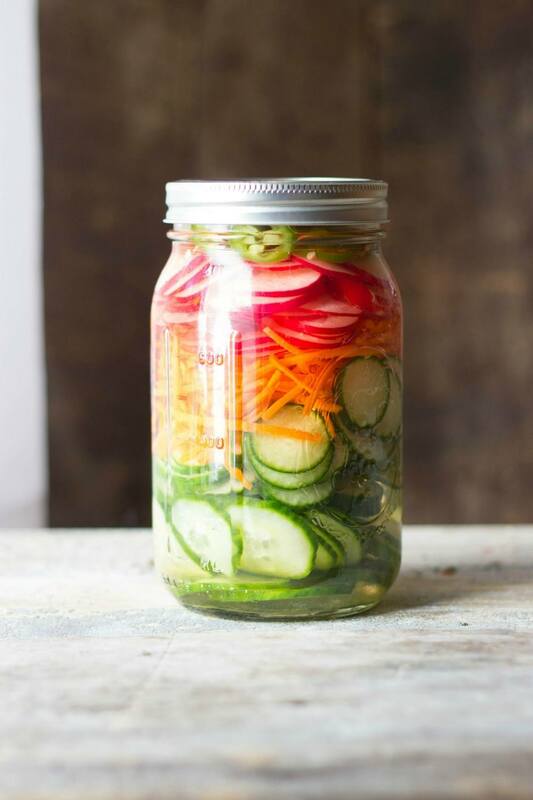 Tightly pack vegetables in a quart jar, then pour vinegar mixture into the jar. Fit with a lid and refrigerate for at least one hour (the longer, the better). To make meatballs: Preheat oven to 375 degrees. Fit a baking sheet with a wire rack, then coat with cooking spray. In a large mixing bowl, thoroughly combine meatball ingredients. Form into 12 2-inch balls and line them on the wire rack. Bake 13-17 minutes, until internal temperature reaches 145 degrees. To assemble bowls: In 6 bowls, layer cooked rice, meatballs, pickled vegetables, cilantro leaves and cilantro Gouda. In a small bowl, whisk together mayonnaise and Sriracha. Drizzle Sriracha mayo on top of meatballs and pickled veggies.